When you click for the first time on Newsfeed, OneDrive, or Sites in the header of a new team site or personal site, or if your administrator has upgraded to the latest version of SharePoint, you’ll probably see a pop-up window suggesting that you update your privacy settings. Updating these settings will allow others in your organization to see newsfeed notifications about what you’re working on. For example, you can let others see when you’ve started following a person or a document, or when it’s your birthday. Default privacy settings prevent your work activities and personal information from being shared with others. We recommend that you update these settings to take full advantage of the new social features. Accepting the suggestion automatically updates your privacy settings to let others see and respond to your site activities. Regardless of your response, you can always manually update your privacy settings later, from your personal site. To automatically update your privacy settings to let your team mates see your work activities, accept the default, and then click OK. 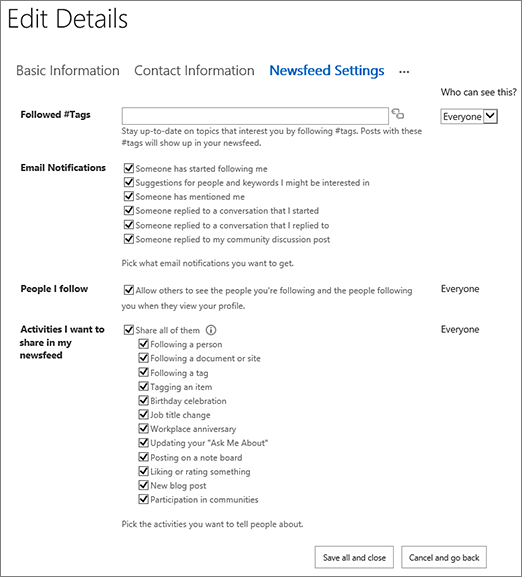 Note: The default privacy setting shares all activities you do on SharePoint with your team. Email notifications you receive are also fully selected by default. Follow the steps in the Manually update your privacy settings section below to change this if you want to share some things but not others. To leave your privacy settings in their protected state, clear the option, and click OK.
Or, click No thanks to decline any of the suggestions in the pop-up window. Your privacy settings in your profile will reflect your choices in the first-run pop-up window. Click your picture, or name in the upper right corner of your SharePoint site, and then click About Me under your name . If you're using SharePoint Online or Office 365, About Me will open in Delve. See View and edit your profile in Office Delve for more info. Click Edit your profile, click the ellipses (…) , and then click Newsfeed Settings. Under Activities I want to share in my newsfeed, select Share all of them to share all your site activities with others, or select only the activities that you want to share.